Children, including some who are unaccompanied, are being endangered by uncertainty in the Mediterranean caused by the Aquarius incident, children’s rights organisation Terre des Hommes warned today. Both Italy and Malta’s refusal to allow the boat, which carried 629 people rescued at sea, to dock in either country forced migrants aboard the Aquarius to spend two days floating in the ocean while their fates were decided. In closing and diverting migrants away from their borders, Italy and Malta have broken human rights law by pushing migrants back into danger rather than allowing them to enter the country. 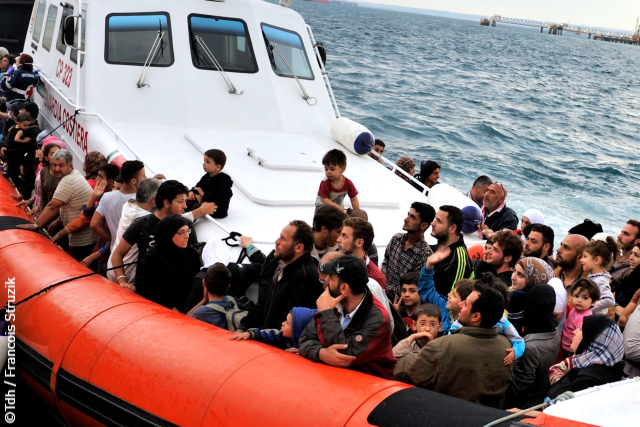 The confusion caused by the Aquarius debacle emphasises how the EU’s migration and asylum policies must be reformed, with human rights and values placed at the centre of the Common European Asylum System, including the Dublin regulation. This must include allowing harbours to open for rescue boats, and providing safe, legal routes to Europe for people on the move. For more information contact Paul Creeney on +32 (0) 465 946 509 or by email at paul.creeney@terredeshommes.org. • 134 children, 123 of which are unaccompanied, and seven pregnant women were on board the Aquarius, putting the number of migrants on board the ship at 629. • Most of those on board the Aquarius have now been transferred to Italian navy vessels and are sailing to Valencia. They are expected to arrive over the weekend. • The Common European Asylum System (CEAS) sets the minimum standards by which all EU Member States must treat asylum seekers and their applications. The Dublin Regulation is included in the CEAS, and establishes which EU state is responsible for an asylum seeker’s application. Picture: Migrants arrive at a port in Italy in 2014.